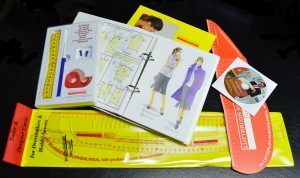 The MINI Lutterloh System Kit comes with 80 fashions and pattern designs, one instruction DVD, written instructions and sewing hints, a tool set and a cardboard tailors-curve. The Tool set includes our special tape measure with sizing scale from 50 cm to 140 cm. bust and hip contour. This special offer includes both acrylic curves (tailor- and designer curve). Astonishingly simple, you need only two measurements to make a perfect fitting pattern every time. The patterns include fashion for women, children and men including casual clothes, dress clothes, wedding wear, dressing gowms, sportswear, swimwear, skirts, dresses, trousers, men’s suits. The Lutterloh System is the wonderful set for making fashionable, professional looking clothing. Choosing and making your own patterns, is the ideal way to create your individual style. The Lutterloh System is the perfect solution for today’s busy sewer. 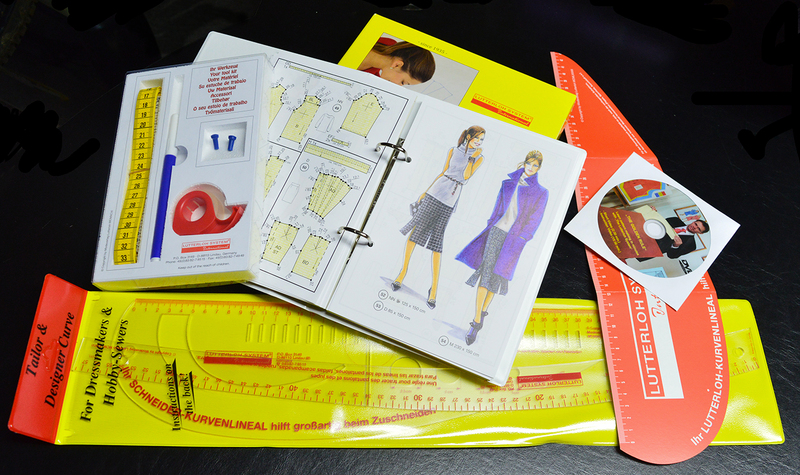 The Tailors Curve: This acrylic ruler is ideal to draw all kinds of armholes, necklines, crotch curves, sleeve caps etc… It also includes a curve for children’s patterns, different button sizes and a right angle. Both rulers come in a protective cover with ‘how to use’ instructions. The Lutterloh system regular kit is recommended for people with a bust and hip measurement up to 140 cm (= 55 inches). In case that your bust or hip measurement is over 140 cm we have our XL System Kit.